"Well, grand-daddy, they can't keep Speedy down." The films of Harold Lloyd have long been unavailable for viewing except through repertory screenings and a dismal set of videotapes long out of print. Part of this is Lloyd's own fault, since other than two features composed of clips, he tended to keep a close control over his film properties. Thus, while Chaplin and Keaton were winning new audiences, Lloyd fell farther and farther into the background. But thanks to a massive restoration effort from the Lloyd Estate, UCLA, New Line and others, the films of Harold Lloyd are ready to be rediscovered in this massive package that includes fifteen feature films. These constitute all but three of his output; Welcome Danger (1929), his first sound feature, is still undergoing restoration, while Professor Beware (1938) and The Sin of Harold Diddlebock (1947) (re-cut and re-released in 1950 as Mad Wednesday) aren't owned by the Estate. Most of the two- and three-reel comedies featuring his famous Glass Character are present here too, along with a sampling of the best of his short one-reel comedies. 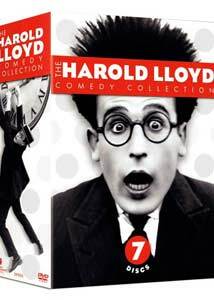 This massive collection of most of Harold Lloyd's most notable films is also available as three separate volumes, though the only way to obtain the bonus disc is in the package of all three. Each of the separately available discs is given a separate review, linked below. Image Transfer Review: Overall, the films all look fine, with some, such as The Freshman looking downright spectacular. Some of the silents have an odd combing that may be the result of incorrect progressive flagging, but it's generally not noticeable unless you freeze the frame. Audio Transfer Review: Orchestral scores are provided by esteemed silent film composers Carl Davis and Robert Israel, and they sound just fine, with nice presence and soundstage. A few films also have an alternate organ score by the great Gaylord Carter, who goes uncredited for some inexplicable reason. The sound features have hiss and noise but nothing beyond what one would expect from early '30s soundtracks. Extras Review: Each volume includes commentaries, production galleries and featurettes, which are reviewed separately. The bonus disc includes a huge pile of additional information, some of which is duplicative but most of it is new and fascinating material. Leonard Maltin hosts an introduction and a 32-minute biography of Lloyd, with reminiscences from daughter Gloria and granddaughter Suzanne Lloyd. A timeline allows one to track Lloyd's career against Hollywood and the world in general. The Life and Times section includes biographies of 13 costars and notable crew members, each a featurette running 2-4 minutes in length. 35 additional featurettes, each about two or three minutes long, cover various aspects of Lloyd's life and work, discussed by historian Kevin Brownlow, archivist Richard Correll, UCLA restoration artist Robert Gitt, and stars Debbie Reynolds, Tab Hunter and Robert Wagner, among others. These are all quite interesting, though their short duration makes one wish desperately for a 'play all' button since you have to keep the remote close at hand. There's also a documentary., Keep Em Rolling, which documents the technical side of making films in the silent era. It's kind of a choppy ADHD presentation, but it does conclude with a fascinating demonstration of use of a silent era camera with modern film. Some massive galleries, arranged by topic and chronological period, contain over 900 rare photos both from his films and his family life. A separate gallery features nearly100 examples of Lloyd's 3-D stereophotography, presented in red/blue anaglyph form (complete with the necessary glasses, of course in Harold Lloyd style). The red/blue works about as well as usual, which is to say not very well though a few shots, such as travel shots of the Grand Canyon, come across fine. There are about 30 pages of pressbook material and 21 lobby cards, plus 33 pages of "vault material such as call sheets, scenarios and poster materials. Be warned, however, that all this gallery material is cropped to a 16:9 ratio. There's quite a bit of home movie footage here too; since Lloyd owned his own production studio and kept his staff on payroll even when nothing was shooting, he had the distinction of having his home movies shot by Hollywood professionals on 35mm sound film! Of course, the content is pretty pedestrian, like most home movies, but it's certainly interesting to see his estate, Greenacres, in all its glory. There's also a brief snippet of footage from Lloyd's funeral. Lloyd himself appears in several materials. The first is a fascinating program from the Social Security Administration (11m:16s) from the 1960s, which has Lloyd discussing his film career and his active service with the Shriners. A USC gala dinner (29m:01s) features a Q&A with Lloyd hosted by Steve Allen and Jack Lemmon that covers some interesting territory, but the most in-depth conversation is the audio presentation (1h:06m:14s) of Lloyd's seminar with the then-brand-new American Film Institute, which offers give and take; not only does Lloyd comment profusely about his career and film technique, but he's also interested in how things in his old pictures work for a modern audience. Lloyd is also seen in his acceptance speech for his 1952 honorary Oscar. He acts as host for four episodes of the radio showOld Gold Comedy Theater that are included here apparently in their entirety. It's an excellent package, but I was a bit taken aback by mention of the fact that the Lloyd vaults have his trailers, as there's no sign of such material on this bonus disc. That's too bad, since trailers for silent films are so very seldom seen on DVD. Easily one of the best sets of this or any other year, with many valuable extras to herald the rediscovery of a great comic genius. Considering the low price for the content (a full 24 hours of classic comedy), you can't go wrong. My highest recommendation.